06 Broadcaster Press 1101 March 20, 2012 www.broadcasteronline.com Announcements - 1101 Events Elk Point Baptist Church. Sunday worship at 11:00am, Tuesday evening Bible study at 7:00pm. 101 North Green St., Elk Point, SD 57069. (605)222-1981 EMPOWERING YOU to take back your life. The Women Rising Support Group meeting weekly. Childcare is available upon request. Call 624-5311 for details. FAITH FELLOWSHIP of the Open Bible on Bypass 50 and Highway 19: Sunday Celebration 10:30 a.m. Pastor Tony Armbrust, 624-2921. FAITH LUTHERAN CHURCH: 401 Main Street, Makell, NE. Worship: 10am. Sunday School: 9am. Communion: 1st and 3rd Sundays. PMA Chad Beckius, (605)658-0240 (home) (402)-692-3323 (church). Faith United Lutheran Church, ELCA, 44874 303rd St/Po Box 168, Volin, SD 57072, (605)267-2277. S u n d a y Worship: 9:30am with Holy Communion the 1st & 4th Sundays. WOW Wednesday program beginning at 6:30pm for all children 3 yrs old - 7th grade, and confirmation classes for those in grades 8th & 9th. FIRST BAPTIST Church Elmer “Sandy” Aakre, Pastor 624-6391 home, 624-4658 church. Time: 9:15 Sunday School, 10:30 Worship. Sunday Choir Practice, 11:50 a.m. GAYVILLE LUTHERAN Church: Sunday School 9:15 a.m., Worship 10:30 a.m. Pastor Ralph Egbert. GOSPEL CHAPEL Church, 708 Jessie St./Highway 12, Newcastle, NE. Sunday School, 9:30 a.m.; Sunday worship 10:30 a.m.; AWANA Wednesday at 7 p.m., 402-355-2305. Pastor Chuck Myers, 402-355-1335. Announcements - 1101 Events GRACE BAPTIST Church, SBC, Pastor Steve Ford, 1102 E. Main. Phone 624-4949. Adult’s and Children’s Sunday School 9:30 a.m. Sunday Worship 10:45 a.m. Prayer Meeting Wednesday Night 7 p.m. GUN SHOW: Pocahontas Iowa, March 24 & 25, 2012, Pocahontas County Expo Center (East of Court House). Antique & Modern Firearms. Saturday 9-5; Sunday 9-4. For info call Chad Boysen 712-358-1051. (MCN) HILLSIDE COMMUNITY CHURCH (C&MA) 1800 Constance Dr. West on Cherry just before you go down the hill. Worship Sept.-May 10:30a.m., May-August 10a.m., AWANA Sunday School small groups. 6 0 5 - 6 2 4 - 4 8 6 2 , www.hillside-cc.com Historic Downtown Yankton seeks Summer Market Vendors reserve your spot today. Call (605)260-3003 or hannasittingcrow@yahoo.com If you used Yaz/Yasmin/Ocella birth control pills or a NuvaRing Vaginal ring contraceptive between 2001 and the present time and suffered a stroke or heart attack or developed blood clots, you may be entitled to compensation. Call Attorney Charles Johnson 1-800-535-5727. IMMANUAL Lutheran Church, Elk Point, SD: Worship Service 9:00 a.m., Sunday School 10:00 a.m. Is food a problem for you? Does weight affect the way you live? Overeaters Anonymous meeting in Vermillion, Saturdays at 9:00am. Sanford Vermillion Hospital, 20 South Plum. (Administration door south of hospital entrance in board room.) KOMSTAD COVENANT Church, Rural Beresford and Centerville, SD: Matt Styles, Pastor. 18 miles north on University Road. Phone 563-2402. Sunday School 10 a.m., Worship Service 11 a.m. Waterproof Boots/Shoes FREE Socks With Boots! Over 20 Styles To Choose From & On Sale! Keep those toes dry! Boston 3rd • Yankton • to Boots Shoes 665-9092 312 W. TODD’S ELECTRIC SERVICE “The Line To Power” Design/Build • Fiber Cabling • Commercial • Residential Service Calls • Boom Truck with Auger • Trenching Serving the Beresford and Vermillion Areas 1-800-560-2518 1221 Cornell St., Vermillion, SD • 605-624-5642 201 NW 13th St., Ste. 3, Beresford, SD • 800-560-2518 unch! L t’s do n son Feed,In c.(JFI) Le E: Joh 012 HER M a rch 2 3 ,2 p m W N: 1 :3 0 W H E : 1 1 :3 0 a m to TIME W e invite you to com e an d join us to discuss the ben efits of M ichelin Ag Tires over lun ch,O N U S! W e are located on the n orth side of Verm illion ,alon g the H ighw ay 50 By-Pass. Announcements - 1101 Events PLEASANT VALLEY Lutheran Church, Rural Vermillion: Sunday School 9:45 a.m., Worship Service 10:30 a.m., Holy Communion First Sunday of every month. All welcome. PROVIDENCE REFORMED Church, 830 Madison: Sunday School 9:30 a.m., Sunday Worship 10:30 a.m. “We Welcome You To Historic Protestant Worship And Fellowship.” Seen Our Signs? Insured, Guaranteed, Locally owned. Call for free estimates/ inspections. Premier Systems (605)665-4655. ST. AGNES Church, 416 Walker St., Fr. John Fischer: St. Agnes Church and Parish Office, tele. 624-4478. St. Agnes Rectory, 505 Catalina, tele. 624-1995. Mass schedule: 5 p.m. Saturday, 8:00 a.m. and 10:30a.m. Sunday, Weekday Masses – consult weekly bulletin; Sacrament of Penance, Saturday 4-4:45p.m. ST. PAUL?S Episcopal Church, corner of Main and Linden. Sunday: nursery available. 10:00 a.m. Holy Eucharist. 11:00 a.m. coffee hour. Call 624-3379 for more info. The Rev. Rita Powell, priest. Sunday evening Experience at ONE HOUR is comprised of two primary elements: powerful worship and a life-changing message. Worship at ONE HOUR is led by a talented live band in a style that is consistent with todays culture and a relevant teaching message from LifeChurch.tv’s senior pastor, Craig Groeschel, via video broadcast. The worship is intense and the teaching is challenging but the environment will be relaxed and casual. ONE HOUR on the USD Campus at the MUC, 6:30pm Sundays! www.one-hour.org Vermillion Food Pantry is located at 816 E. Clark Street. Check our website to see if your family would be eligible for food assistance this month. 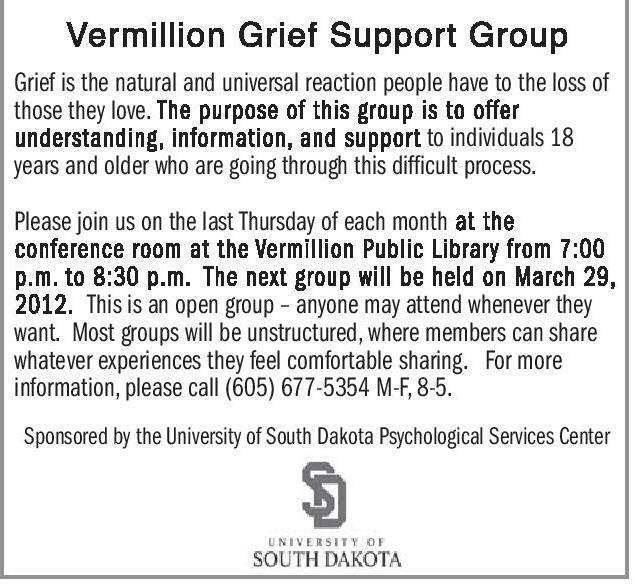 www.vermillionfoodpantry.org Announcements - 1101 Events The Alzheimer & Memory Loss Caregiver Support Group sponsored by the South Dakota Alzheimer’s Association, will meet the 4th Monday of each month, 7pm, at the Vermillion Public Library. Caregivers of memory loss persons are welcome to attend. Contact persons: Fern Kaufman, (605)624-4898, or Marilyn Abraham, (605)934-2534. The USD Luther Center, where church and flip-flops go together! The Luther Center, at the corner of Cherry & Plum, Vermillion, has weekly worship services on Wednesday evenings at 7p.m. and 5 Alive meal and devotional gathers on Sunday evenings at 6p.m. during the school year. Announcements - 1200 Cars Events DONATE YOUR CAR, TRUCK Vermillion Alcoholics Anonymous Group: A fellowship of men and women banded together to help each other recover from alcoholism. Meetings are held in the Post Office basement. Closed AA on Tuesday, 8 p.m. Closed AA on Friday, 8 p.m. VISUALLY IMPAIRED meeting, 1:00 every second Monday of the month. For information 605-624-4063 or 605-653-1000. WANT TO ADVERTISE TO THE MIDWEST? Place your classified ads in the Midwest Classified Network anytime online at www.midwestfreeclassifieds.com (MCN) 1200 Cars The Vermillion First United Methodist Church, a welcome place reaching out to all God’s people. Located at 16 N. Dakota St., Sunday School 9:15am, Worship 10:20am. Call 624-2179 for more info. Pastor Rick Pittenger. A-1 DONATE YOUR CAR! Breast Cancer Research foundation! Most highly rated breast cancer charity in America! Tax Deductible/Fast Free Pick Up. 800-771-9551 www.cardonationsforbreastcancer.org TRINITY LUTHERAN CHURCH, 816 E. Clark, 624-4442: WORSHIP: Saturday Evening at 5:30pm; Sunday Morning at 10:00am. Holy Communion on the 1st and 3rd Sunday each month. Sunday School, 9am. Info: www.trinityvermillion.org nani Unitarian Universalist "The Uncommon Denomination." Services are the first and third Sunday of each month at 7 p.m. in the basement of the United Church of Christ, 226 E. Main. Child care services and refreshments provided. All welcome. Info: www.unitarianvermillion.blogspot.com UNITED CHURCH OF CHRIST CONGREGATIONAL, 226 E. Main St., Pastor Steve Miller. 10:30a.m. Worship Service. No Longer S t r a n g e r s www.uccvermillion.org YOUR RADIATOR HEADQUARTERS! Introducing the NEW NAPA Radiator Program • Great Parts • Great Warranty Cox Auto AM Lawn Care On-Hand & In-Stock! NO WAITING! 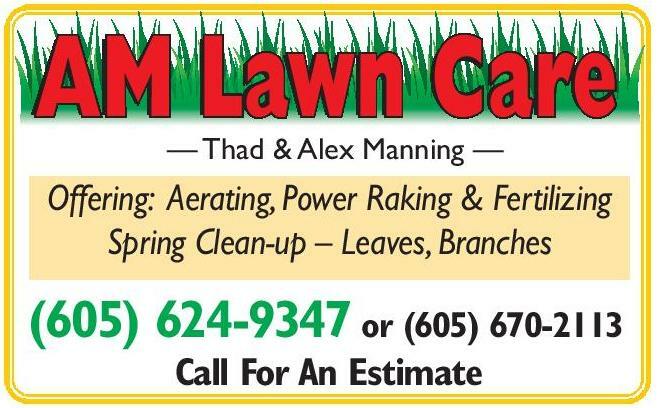 1007 Broadway Ave. • Yankton • 665-4494 — Thad & Alex Manning — Offering: Aerating, Power Raking & Fertilizing Spring Clean-up – Leaves, Branches CARS/TRUCKS WANTED! Top $$$$$ PAID! Running or Not, All Years, Makes, Models. Free Towing! We're Local! 7 Days/Week. Call Toll Free: 1-888-416-2330 nani DONATE YOUR CAR to CANCER FUND of AMERICA to help SUPPORT CANCER PATIENTS. Tax Deductible. Next Day Towing. Receive Vacation Voucher. Call 7 Days 1-800-835-9372 . nani OR BOAT TO HERITAGE FOR THE BLIND. Free 3 Day Vacation, Tax Deductible, Free Towing, All Paperwork Taken Care Of. 888-757-6941 (MCN). MISC AUTOS: CASH FOR CARS: Any Make, Model or Year. We Pay MORE! Running or Not Sell your Car or Truck TODAY Free Towing! Instant Offer: 1-888-420-3805 (MCN). TRUCK DRIVERS WANTED Best Pay and Home Time! Apply Online Today over 750 Companies! One Application, Hundreds of Offers! www.HammerLaneJobs.com (MCN) 1240 Boats - Watercraft 1994 17? Sylvan boat, 150hp. Merc. motor. Lots of accessories. 1969 Cougar, new motor & transmission. 1995 Saturn, 82,000 miles. Further details (605)665-9291. 1250 Motorcycles WANTED JAPANESE MOTORCYCLE KAWASAKI 1967-1980 Z1-900, KZ900, KZ1000, ZIR, KZ1000MKII, W1-650, H1-500, H2-750, S1-250, S2-350, S3-400 Suzuki GS400, GT380, CB750 (69.70) CASH PAID. 1-800-772-1142, 1-310-721-0726 usa@classicrunners.com nani 1400 Services PREGNANT AND AFRAID? C a l l Birthright 665-5580 (Yankton); 258-3436 (Sioux City); 3348 4 1 1 (Sioux Falls); 1-800-550-4900 ( t o l l free). 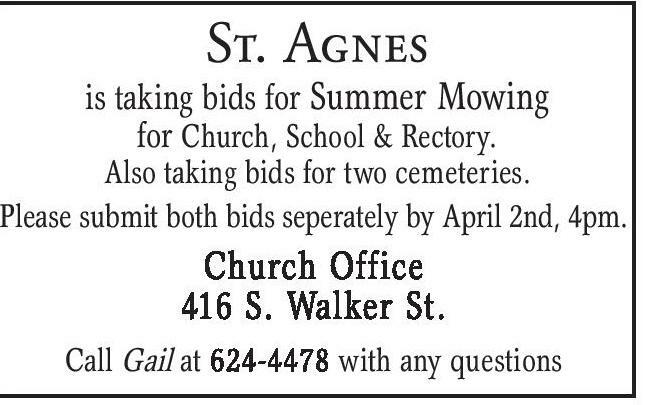 St. Agnes is taking bids for Summer Mowing for Church, School & Rectory. Also taking bids for two cemeteries. Please submit both bids seperately by April 2nd, 4pm. Church Office 416 S. Walker St. Call Gail at 624-4478 with any questions Vermillion Grief Support Group Grief is the natural and universal reaction people have to the loss of those they love. The purpose of this group is to offer understanding, information, and support to individuals 18 years and older who are going through this difficult process. Please join us on the last Thursday of each month at the conference room at the Vermillion Public Library from 7:00 p.m. to 8:30 p.m. The next group will be held on March 29, 2012. This is an open group – anyone may attend whenever they want. Most groups will be unstructured, where members can share whatever experiences they feel comfortable sharing. 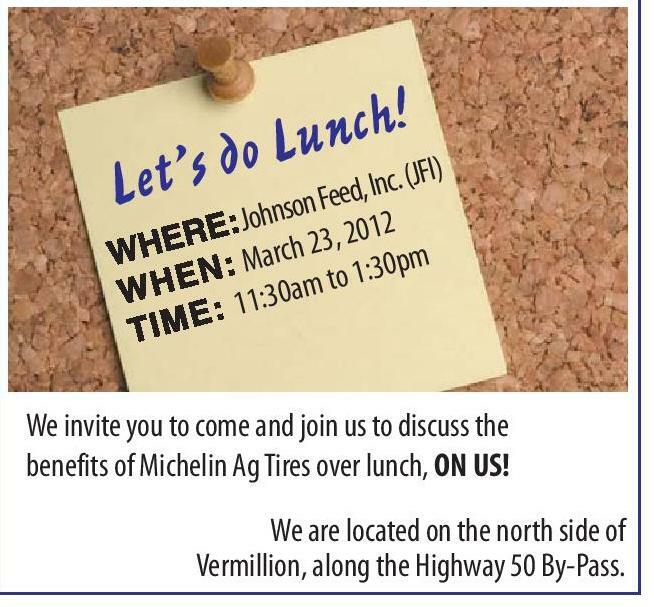 For more information, please call (605) 677-5354 M-F, 8-5. Sponsored by the University of South Dakota Psychological Services Center (605) 624-9347 or (605) 670-2113 Call For An Estimate March 27, 2012 Clay-Union Electric Annual Meeting Clay-Union Electric The annual meeting of Clay-Union Electric is to be held Tuesday, March 27, 2012, at the school gym in Wakonda, S.D. Member registration will start at 5 p.m. and meal will follow. The 2012 annual meeting will mark the 76th annual meeting and the 77th year of providing electric service to the members of Clay, Union and Yankton counties. The business meeting will start at 6:45 p.m. and last approximately one hour. The meeting will feature reports on financial and work activities of your cooperative as well as director elections for District 1 and District 2. The current Director from District 1 is Terry Munter and Director from District 2 is Gordon Andersen.